Do you feel you’re missing everything except your life in the hospital? It’s either you’re so deeply attached to your patients or you just want to kill yourself (social life) slowly and painfully. This doesn’t have to be the way a nurse lives. Do not live in the your medical scrubs all the time. All work and no play is never fun. One important thing in life that all of us shouldn’t miss is fun. Despite all the anxieties in life, one must find time for enjoyment and relaxation. It’s more like an obligation to ourselves, not an option. Life and time are too precious to simply fill it all up with worries. The secret is balanced life. But how is this achieved? Claire Westwood shared her discovery of balancing life with just one hour in every week. 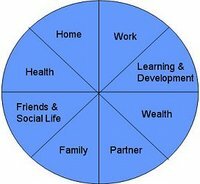 She calls it “Wheel of Life.” The steps to make the wheel roll are fairly simple. Within a month to 12 weeks, set aside one hour for things that you want to do or something you’ve been missing because of your busy career. Set feasible goals with which you want to make developments constantly. And after each week, review the changes these have brought. Work * do you like your job, is it a good match to your skills and values? Partner * Do you have one, how good is your relationship, or are you single and happy or miserable? Rate yourself with a score out of 10 for how happy you are with every area. Identify what would make that area score 10 out of 10 for you. This is a chance to fantasize about what you would really love in your life. What would be a fabulous outcome, or dream for you? Be bold, and don’t worry about reality just yet – this is an exercise to stimulate ideas. Write them all down. What would you really want if you could have or do anything? Organize this information in a way that suits you. You can use a journal or notebook or A4 paper in an attractive file, or computerize it. How you use the ‘Wheel’ is up to you. Get a scrap book and write on it, in it, stick pictures to it, scribble notes in it, use the spaces to add images and color – whatever helps you become inspired. You can write your weekly and 12 weekly goals, and tick off each action. Spend longer on one topic if you want to – read more information and gather or develop new ideas – or look at all eight. An extra notebook or journal is important as well, to write down all your thoughts and your feelings on the various issues. Writing things down is one of the best ways to really understand, and reflect on, what is really happening. Note as many thoughts down as you can. The more you can write down, the better. It is a great motivator to re-read journals and notes to see how far you have come. Situation For each section of the ‘Wheel’ assess exactly what is going on for you right now. Remember to look at successes and happy occasions, what you enjoy, as well as what you are dissatisfied with. Keep a diary for a week or so to reflect on the reality of the situation. What is working well? What achievements have you made in that area? What are you unhappy with? Write as much as you can – keep thinking and writing. Target What would be your ultimate `goal’ or target for each section? Action – possible and actual List all the ideas you can think of to improve each area of your life, enlist friends, your partner or a coach to help you. Then identify which of these you are actually going to do. If they still scare you, make them smaller and easier. Just do the first thing. Any action is better than none. Was it up to you, or others? Reward Treat yourself to an appropriate reward. Specific – What exactly do you want, in what part of your life? Time bound – When will you achieve it? Ask yourself great questions like ‘How can I achieve that?’, ‘Who can help me?’, ‘Where can I find the information?’ By asking yourself questions, you are setting up your subconscious to find answers to them. Identify one small action you can take this week to move you from where you are now towards your ‘10 out of 10’ place. When you have identified one action that will move you closer to your ultimate goal, decide exactly when you will do it – the sooner the better – then do it! It can be as simple as buying a health magazine this afternoon, eating an extra piece of fruit each day this week, phoning an old friend for a chat, looking in an estate agent’s window, taking your child to the cinema – whatever is right for you. Do it today, or at least this week. Make a start! JUST DO IT! One action at a time. It all adds up. One action a day means 365 in a year. That can make an enormous difference to your life. Once you start to make changes the momentum of taking regular actions can surprise you. Your energy levels will soar, and you will get far more done than you thought. The most important thing is that you MUST take action. Get help and support. Find a colleague or friend who wants to improve their life, and work together. This should be an exchange of ideas with encouragement and praise for each other. You might as well wanna do something like this fellas did.